This product has been discontinued with limited quantities left. Customers should call for more info. 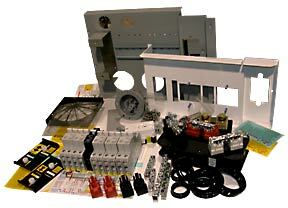 This kit provides all the necessary breakers and brackets to assemble your own Power back up system. The /GEN versions have the extra generator input transfer switch and AC inlet. Use these kits with our "B" or "C" battery enclosures. Description: This large backup kit provides all the necessary breakers and brackets to assemble your own Power back up system.